NASA said it will test the effects of a large fire in space by setting off a blaze inside an orbiting unmanned space craft. NASA has set off tiny controlled fires in space in the past, but never tested how large flames react inside a space capsule in space. This research "is crucial for the safety of current and future space missions," Gary Ruff, one of the engineers heading the experiment at the US space agency's Glenn Research Center in Cleveland, Ohio, said Tuesday. The goal is to measure the size of the flames, how quickly they spread, the heat output, and how much gas is emitted. The experiment will be conducted in an Orbital ATK Cygnus capsule after the craft ferries supplies to the International Space Station. The Cygnus capsule is scheduled to blast off from Cape Canaveral, Florida, atop an Atlas 5 rocket on its final mission on March 23. Once the capsule undocks from the ISS and is far away from the space station, ground control will trigger the fire on board, Ruff said. The results of this experiment, dubbed Saffire-1, will determine how much fire resistance is needed in the ultra-light material used in the spacecraft and the astronaut's gear. It will also help NASA build better fire detection and suppression systems for their spaceships, and study how microgravity and limited amounts of oxygen affect the size of the flames. "Understanding fire in space has been the focus of many experiments over the years," said Ruff. While many "small, centimeter-sized fires have been lit in space before, to really understand fire, you've got to look at a more realistic size." Temperature, oxygen and carbon dioxide sensors will record data on the fire, which is expected to last about 20 minutes, in real time. Cameras also will film the material as it burns. 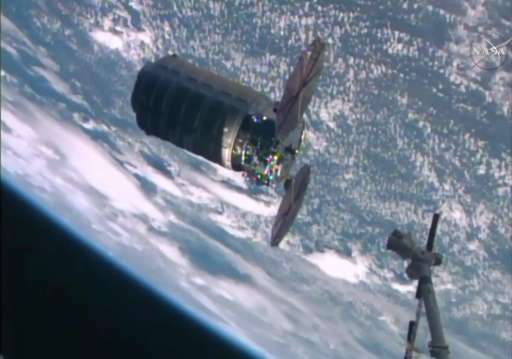 A few days after the blaze, NASA expects the remnants of the Cygnus capsule to plunge towards Earth and disintegrate in the atmosphere. Idiots already know, did they forget? This one was filled with 3-men and pure oxygen: Apollo 1 fire, a tragedy that killed three astronauts in 1967! Which was a fire on the ground at launch. Not in space without gravity and such. I hope they remember to simulate the forced ventilation of the ISS. Without gravity driven convection; a fireball can only spread by diffusion and radiation if they don't. Wish they had stated what they expect and then reveal how spectacularly wrong they were, after all that would only prove how much it was worth it. What the heck is "gravity driven convection". I just wish the would do something creative with the old spacestation bits. Can't they design a propulsion and landing framework to install on these and launch them to the moon to land them inside one of the moon caves or deep craters? This IS CREATIVE re-use of space hardware: The ATK burns up on re-entry anyway. There is so much we don't know about fires in space. The enclosed atmosphere and micro-gravity and all the fans and ducting required for ventilation and forced cooling make it a very unusual environment. Even ordinary fire extinguishers are more hazardous there. Perhaps, without convection t o cause updraft, some big conflagrations would quickly starve themselves of oxygen if the electrical heat sources and convection fans were briefly cut? This is important info that NASA needs to run these tests for. Good idea. But I got a question: how about if they test how to put the fire out? not much needed to study that except a closed metal box & system that blocks out external atmosphere and has one of it's own etc like a submarine (but less pressure) ... so that is already studied, to tell the truth.